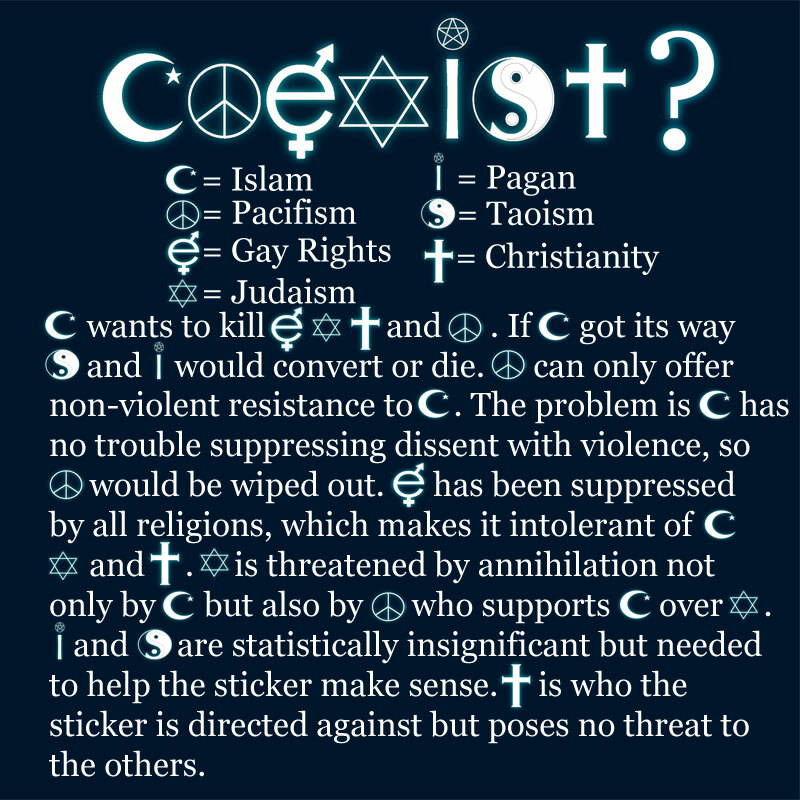 Friday Fun: Can We Really All Coexist? Yes; with classic tolerance we can coexist. With the “new” tolerance, we will never coexist. Christianity is a threat to the others! Oh yes, I wonder if we can coexist if we have idiots like the person who wrote that in the world. It is intolerant, stereotyping and ignorant to say such things about the religions. Every group has its extremist but not every Christian wants to hit you over the head with a Bible screaming “convert!” just as not every Muslim is a terrorist. Coexist means to live in harmony and it is achievable. The only thing standing in the way is people like the writers of that picture who judge based on extremists and stereotypes, not reality. This COEXIST foundation is just trying to form a One World Religion that will happen because The Holy Bible fore told it, but no true Christian will ever be apart of this LIE. Come out from among them (Sinful, unholy, Gays, Lesbian, etc) and serve the one true God, Jesus Christ. COEXIST? GOD FORBID!